This story appeared on the news site Before It’s News, on January 3, 2016. It is the only source of information for this skull. Nobody has gone down to verify or examine the skull. Therefore, in this article I have provided some more information about the kind of creature this skull probably belongs to. 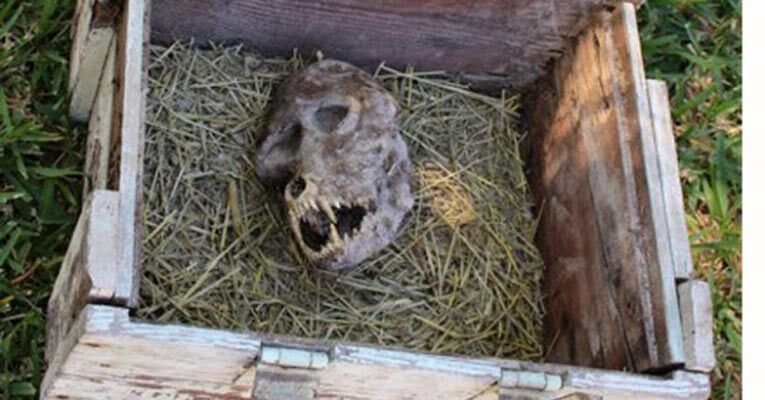 One of the readers of Before It’s News sent in some pictures of a very strange skull he took when he met a farmer in Bulgaria who had dug up the skull. The farmer told Filip Ganov, a Bulgarian student, who was in the village doing research on the Balkan Wars, that he had dug up a wooden box when plowing a field. The box was closed by means of a chain. When he opened the box he found a skull that, according to him, is the skull of a werewolf. The inside lid of the box contains lettering in Cryllic script which is common in Bulgarian and Macedonian languages. No translation was given of the lettering. The farmer would not part with his werewolf skull but he did let Ganov take pictures. Ganov showed the pictures to a wildlife expert in Bulgaria who speculated that it might be from a wolf. He surmised the wolf was suffering from Paget’s disease. Paget’s disease is a deformity of bones. Before It’s News did not give a translation of the text on the box, so I looked it up myself. The Cyrillic alphabet is Macedonian, and it reads “beware of the dangerous vrkolak”. The last name, vrkolak, actually is spelled врколак. On the box the third letter ѫ is called Big Yus which represents a nasalized back vowel. All modern Slavic languages that use the Cyrillic alphabet have lost the nasal vowels, making yus unnecessary. Big yus can be found in the Romanian Cyrillic alphabet until about 1860. However Big yus was a part of the Bulgarian alphabet until 1945. The last letter ь is not a real letter; ь used to be a very common letter in the Russian alphabet. This is because before the 1918 reform, any word ending with a non-palatalized consonant was written with a final Ъ. There are different spelling of the word in Central Europe. Vrkolak means werewolf. Based on the spelling, the box might date from before 1860. 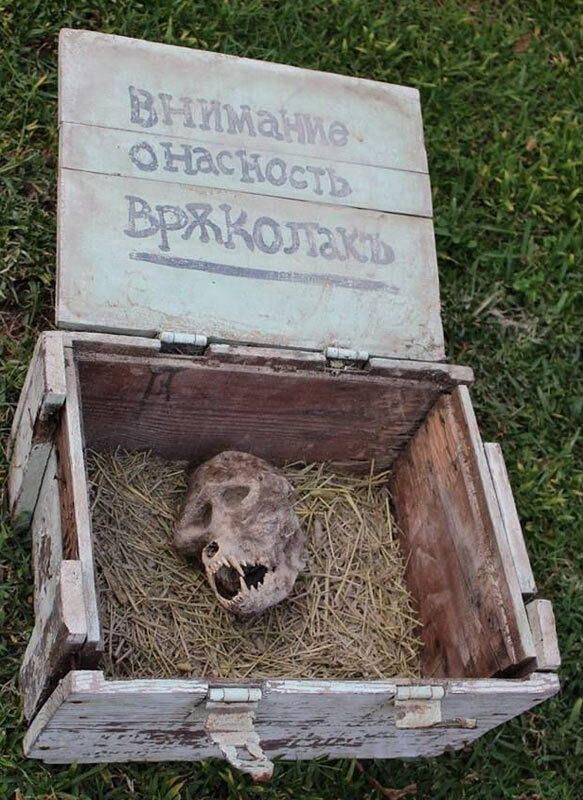 So,…maybe the person who put the skull in the box and buried it, might have shot a werewolf! If you don’t know anything about skulls, and you believe what experts are claiming, you are likely to just believe what they are saying. After all, werewolf are just legends, aren’t they? Well, in my opinion, this is the skull of a creature that is also called a wolfman, or dogman. In Europe they use the term werewolf, because of centuries-long stories and legends. I have read several stories of people who have encountered a wolfman or dogman in the USA, and their descriptions are exactly the same as those of the werewolf in Europe. If we leave behind the tales and legends that have been woven around the werewolf, and solely base ourselves upon the testimony of people who have actually encountered that creature, we can say that it definitely exists. It is described as being the size and shape of a man, but with a wolf-like head. Its appearance always strikes fear and terror in those who came across it, because it seems to posses intelligence, but it also has a predatory, aggressive behavior. That wildlife expert in Bulgaria should have known that the skull is not that of a wolf, even if the skull would have been deformed by a disease. Maybe he knew that, but as an ‘expert’ he cannot say that it is the skull of a werewolf, because that is not in his textbook. This is the Novo Selo skull. The mouth is identical with a wolf skull, but is missing the two openings left and right of the nose. The nose hole is smaller too. The major difference is the top part of the skull. A wolf skull has its eye sockets placed at the side of the skull. The Novo Selo skull has them in the front of the skull, and close together. As far as we can distinguish in the picture, the Novo Selo skull has brow ridges too, which are lacking in a wolf skull. 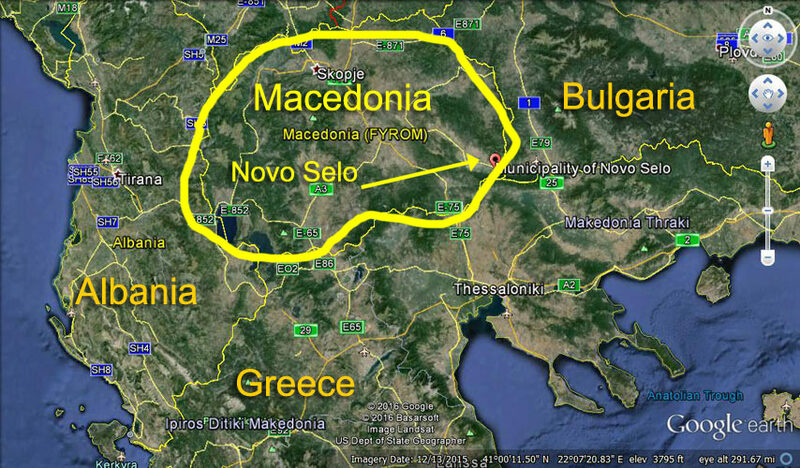 The Novo Selo skull is not a baboon skull either, because all the teeth are different. The eye sockets of a baboon are also close together. The baboon eye-sockets are round, the Nobo Selo skull has triangular eye sockets. An Australopithecus (lived between 2 and 4 million years ago) skull comes close in regards to the forward facing eye sockets, which are also close together, and the brow ridges are similar. Hominids (now they use the term hominins) are the the group of different human species that have lived on this planet, but are now extinct. Important too is that the shape of the eye-sockets of the Novo Selo skull are tapering of to the sides, which is not found in primates or hominins. The brow ridges point upwards between the eyes, which is strange. So what are we looking at? The Novo Selo skull seems to be a blend of a wolf and a hominin or a primate. Or a human related species with wolf characteristics. Or shall we say a genetic engineered species? Those who are familiar with the Atlantean civilization, and/or with the extraterrestrial presence on Earth, know that genetic engineering of species has always been common place on this planet. 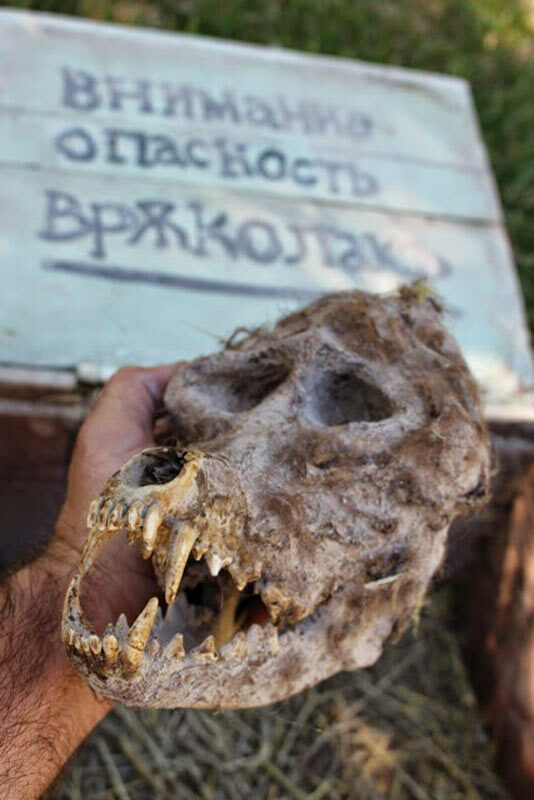 In all likelihood, the Novo Selo skull is the skull of a wolfman, or dogman, or werewolf. The wolfman is a creature rarely seen, but it always leaves a tremendous impression, because of its fearful appearance. What does a wolfman, dogman, or werewolf look like? The following two drawings are from somebody who actually encountered this creature. This person relayed the encounter to Phantoms and Monsters website, which published the images at a later time. My buddy who was sitting in back of my hatchback car said what¹s that, and in tall weeds on the side of the road were two yellow eyes, kind of slanted in a way. It didn¹t have a long snout like a dog, but the snout was narrow. It wasn¹t human and wasn¹t dog. It wasn¹t flat faced like human, all I saw was hair underneath what I presumed to be a jaw. Like a cape or mane. From what I saw, it was kind of slender in stature, not beefy, I would guess 210-220 pounds. The head reminded me of a canine shape, the kind of triangle-looking head. It was looking completely straight on at us. It could have had ears but was too dark to see them. If you want to read more stories of people who encounter the dog man, wolfman or werewolf, go the the website The Beast of Bray Road. With Bigfoot, or Sasquatch, we know that they are surviving hominins, who live in families in very remote areas, in many different places around the world. But were does the wolfman, or werewolf, live? Although he is seen on occasion in this physical world, he seems to actually live in another physical dimension, like so many other so-called ‘cryptic creatures’, who are seen on occasion, but do not actually live here: for example the mothman, pterodactyls, illusive large black cats and many other strange creatures. Some psychic people have hinted at the existence of another physical realm that lies ‘next’ to this one, and that is also populated by beings. Once in a while, on places where there is an energetic overlapping, usually called vortexes or portals, these creatures can enter into our dimension. It seems that the wolfman is one of those creatures that knows how to use these portals. One of those people is Kewaunee Laspseritis. In Linda S. Godfrey’s 2006 book Hunting the American Werewolf, she has researched and collected demographic data showing that Wisconsin has more reports than other states of man-like, hairy beings with a wolf’s head and paws, as large as a deer, usually bipedal, but at times running quadrupedally! There are also sightings from the upper Midwestern states, and from New York to the southeastern states as well. Some wolf-men were reported to be six-and-a-half to seven feet tall when ambling on two legs. I had heard of werewolf-types being encountered in different states, but wrongly assumed that it was merely a Sasquatch being misreported. After reading Ms. Godfrey’s book, it was obvious that there was an entirely different phenomenon and, once again, the most likely source of entry into our world is a wormhole. For eight years I lived in Wisconsin and interviewed people who encountered Bigfoot and UFOs, but never knew how prevalent “wolf-man” sightings were. I do not believe for a moment that people are transforming into werewolves during the full moon. On the television show, “Monster Quest,” three witnesses observed three wolf-men during daylight hours drinking from a stream. They immediately fled the area. Just when I think I’m close to having a better understanding of the Bigfoot phenomenon, a witness informs me of something queer and extraordinary. One day I visited a woodcutter friend who supplied me with cord wood. He was standing in his yard talking with a friend whom I did not recognize. When he introduced me to Jerry, he added, “Kewaunee is the guy I told you about that wrote a book on Bigfoot!” Then he proceeded to coach Jerry along by telling me about Jerry’s Sasquatch encounter. But Jerry was reserved and a bit distrustful, and never said a word. A month later I stopped again and Jerry was helping him in his shop, fixing a truck. We chatted for an hour and Jerry surprised me by saying that he would like to buy a copy of my book. Then he told me that in 2006 while working over on the Olympic Peninsula, he and a friend had driven down a logging road to check some trees. They were sitting in the truck, smoking cigarettes, and just as he was about to step out of the vehicle, Jerry was alarmed to see what appeared to be five Bigfoot creatures some 25 to 30 feet away, standing and looking at them. One of the beings, who was six feet in height, walked up to the truck, ducked down, then slowly rose up, pressing its face against the window to see inside. This freaked them out! Jerry kept stopping in the middle of his story about the encounter to see my reaction, because he didn’t want to be made fun of or get into an argument about its authenticity. He continued by stating that the group of creatures was milling around and when he stared at them to get a better look, he noticed one that was very different from all the rest. It had a wolf-like face with an extremely long neck that made it look awkward in appearance compared to the others. Then Jerry told me it resembled Anubis, the ancient Egyptian god of the Underworld, except for the odd long neck! He stared at me in a serious manner and said, “Kewaunee, ‘m telling you the truth!” Also, he would not tell me specifically where the encounter occurred, because he did not want anyone disturbing the area. Anubis is depicted in hieroglyphics as a being with black skin with the head of a wolf, but with a normal human body and neck. Was the Anubis-type being a genetically engineered humanoid creature dropped off by ETs? Had the group just stepped through a portal, because the beings had not been there when they stopped the truck? It’s very baffling! After Jerry left, my woodcutter friend said, “He’s a hell of a nice guy, and he’s not a liar either.” Jerry still sticks to his story. At times It’s mind-boggling to sift through such data, yet it is potentially valuable information. I have included Jerry’s account with hopes that a reader light have had a similar sighting and would contact me and share it. Could it be that wolf-men, like the Sasquatch people, are humanoids who have tremendous reasoning abilities, use mental telepathy, and have families on the “other side”? I feel it would be useful for Bigfoot researchers to read Godfrey’s book to better understand other parallel phenomena to compare against Sasquatch behavior. The association with portals among these alien-animal phenomena is the factor that stands out the most. To truly understand the phenomenon and solve the Sasquatch mystery, it is important to take a long hard look at other overlapping phenomena—no matter how extraordinary they appear on the surface. Thus far, the research into the nature of Sasquatch people has been very superficial, because the majority of people are looking for a non-human primate! A month later, while sitting in her car at the farm with the window down gathering her thoughts, a gigantic wolf-like canid walked up to her car door. Its huge black head was level with the open window. As the woman turned around to get a better look, the animal gently stuck its massive head into the car, licking her in the face before she could react. Again, the experiences said she doesn’t know why, but she had no fear. The black “wolf’ then slowly walked away. Where on Mother Earth would a cryptid such as this come from? Additionally, the witness saw a werewolf-type bipedal creature that she said the Sasquatch do not like. The Serapeum of Saqqara, Atlantean Technological Devices?